I'm so sad I missed the One Kings Lane sale on this company's wares. In2Green is just the type of company I look to patronize. Their sustainability efforts are matched by on-target style. 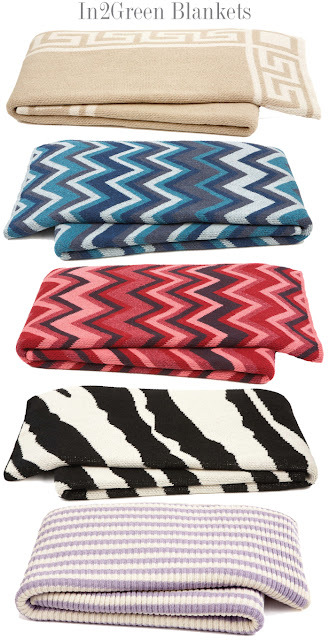 Here are a few of their fantastic eco-friendly throws. A big thank you to Kyle for the intro! I'm so excited out this green discovery. We sell those at Isabella!! They are really cute. You should stop by sometime! love the purple one!! super pretty. Wow!... these are all amazing blankets. They're very beautiful :) the colors and the design is fantastic. Thanks for sharing!